Start off your visit on the 25th (Tue): explore the engaging exhibits at Chacha Nehru Children’s Museum, examine the collection at Puthenmalika (Kuthiramalika) Palace, and then admire the striking features of Sree Padmanabhaswamy Temple. Planning Thiruvananthapuram (Trivandrum) trip won't be overwheling when you use's Insprock itinerary maker. New Delhi to Thiruvananthapuram (Trivandrum) is an approximately 5-hour flight. You can also drive; or take a bus. Traveling from New Delhi in June, expect nights in Thiruvananthapuram (Trivandrum) to be about the same, around 29°C, while days are a bit cooler, around 36°C. Wrap up your sightseeing on the 25th (Tue) early enough to drive to Thekkady. Kick off your visit on the 26th (Wed): explore and take pictures at Green Park Ayurvedic & Spices Plantation, explore the activities along Periyar Lake, and then look for all kinds of wild species at Periyar Tiger Reserve. Here are some ideas for day two: see the interesting displays at INTERPRETATION CENTRE Periyar Tiger Reserve, contemplate the long history of Shiny Tours & Travals, get great views at Chellarkovil Viewpoint, then explore and take pictures at Spice Walk, and finally admire the natural beauty at Green land spice garden. To see more things to do, other places to visit, and more tourist information, go to the Thekkady road trip planning website . You can drive from Thiruvananthapuram (Trivandrum) to Thekkady in 3.5 hours. Another option is to take a bus. Finish your sightseeing early on the 27th (Thu) so you can drive to Kochi (Cochin). 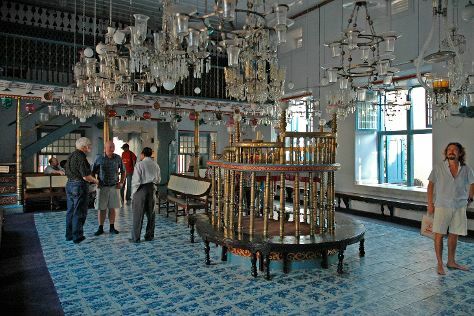 Kick off your visit on the 28th (Fri): take an in-depth tour of Antique Museum Kochi, take in the spiritual surroundings of Paradesi Synagogue, then admire all the interesting features of Kerala Kathakali Centre, then take in the spiritual surroundings of Church of Saint Francis, and finally don't miss a visit to Chinese Fishing Nets. For where to stay, photos, and more tourist information, use the Kochi (Cochin) trip itinerary planner. Traveling by car from Thekkady to Kochi (Cochin) takes 2.5 hours. Alternatively, you can do a combination of bus and taxi. June in Kochi (Cochin) sees daily highs of 36°C and lows of 28°C at night. Wrap up your sightseeing on the 28th (Fri) early enough to travel back home.